"A picture is worth a thousand words", goes the old adage - and that is certainly true of a new book of photographs of England's seasonal festivities captured by Sara Hannant. The book is called Mummers, Maypoles and Milkmaids: A Journey Through the English Ritual Year and it is full of wonderful photos taken at events such as the Imbolc Fire Festival in West Yorkshire, Jack in the Green celebrations on May 1, midsummer at Stonehenge, the Sussex Bonfire Societies' displays on November 5 and the Druidic midwinter ritual on London's Primrose Hill. It holds few words - brief details of what each event is called, where it takes place and when, followed by a short description of what goes on and the history. Sara's sources are reputable - she lists folklorist Steve Roud's The English Year, books by respected historian Professor Ronald Hutton and material from archives of The Folklore Society - but her pictures show what words can't. They capture a sometimes humorous juxtaposition of old tradition and the modern world. In one image a man dressed up as a straw bear goes into a travel agency; in another an advertising poster of an angry face seems to be shouting at girls dressed in white milkmaids' dresses. A shot taken during Eastbourne's Lammas parade shows giants reflected in a car window with the high street shop Past Times in the background; druids processing along the ridge of Primrose Hill are photographed against a skyline of tower blocks and high-rise buildings. The pictures also show that the English weather can be less seasonal than the celebrations themselves. In one, people shiver in winter coats and under blankets while watching young girls perform a maypole ribbon dance. But Sara Hannant manages to capture the magic of the festivities too - smiling faces, enthusiastic dancing, wild bonfires and people of all ages and all walks of life sharing a joyful holiday. These are occasions when the English are at liberty to let go of their reserve, to sing and dance, to eat and drink and make merry, to dress up as a king or queen or play the fool just for a day. Although many of the seasonal rituals depicted in Mummers, Maypoles and Milkmaids are relatively recent revivals of older traditions - or even completely modern inventions - they are in my opinion a far more honest form of entertainment than much of the mass-market fare churned out by the media. They bring communities together, inspire creativity and boost the local economy as well as allowing those who take part to celebrate the changing seasons and connect with history. Sara's book will hopefully inspire many more people to find a seasonal celebration near where they live and to go along and take part. 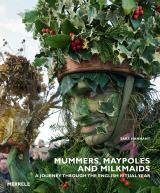 Mummers, Maypoles and Milkmaids: A Journey Through the English Ritual Year is published by Merrell and can be ordered through Amazon.